Millions of women in the world have fought or are currently fighting breast cancer. Show your undying support for their ongoing battle and your passion that a cure will be found by hanging this awareness ornament on your tree. 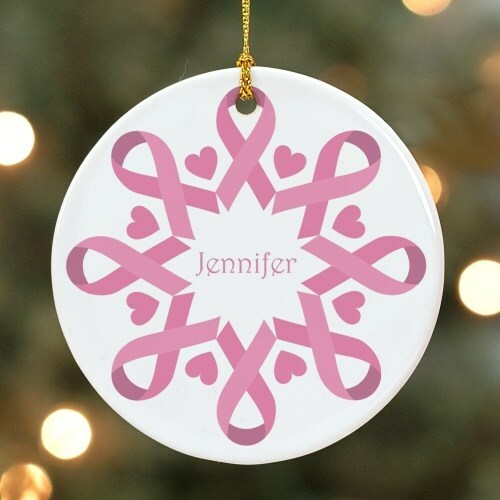 This Pink Ribbon Ceramic Ornament is a flat ornament and measures 2.75" in diameter. The Ornament includes a ribbon loop so it can easily hang from your tree or ornament stand. Free personalization of any name is included. The fight against breast cancer is ongoing, even for survivors. This holiday season, band together in solidarity by hanging this snowflake ornament from your holiday tree. Our Pink Ribbon Awareness Ornament would be another great addition.